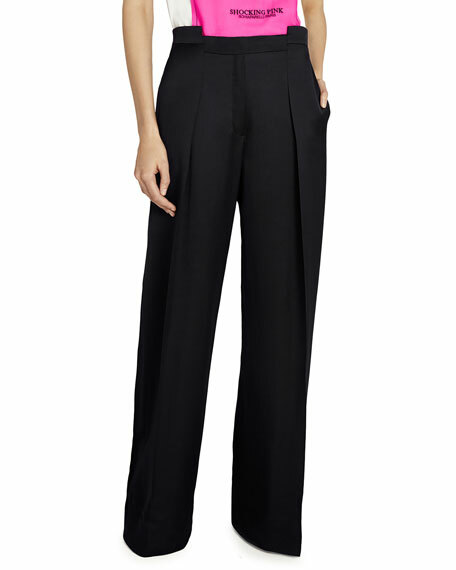 Wide black silk satin trousers. 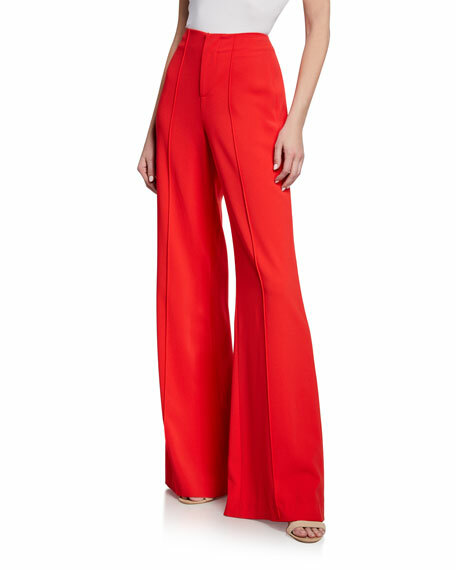 Alice + Olivia "Dylan" pants. Approx. measurements: 9.5" rise; 34" inseam; 45" outseam. High-rise. Wide, flared legs. Back welt pockets. Full length. Hook/zip fly. Polyester; lining, polyester/spandex. Imported. 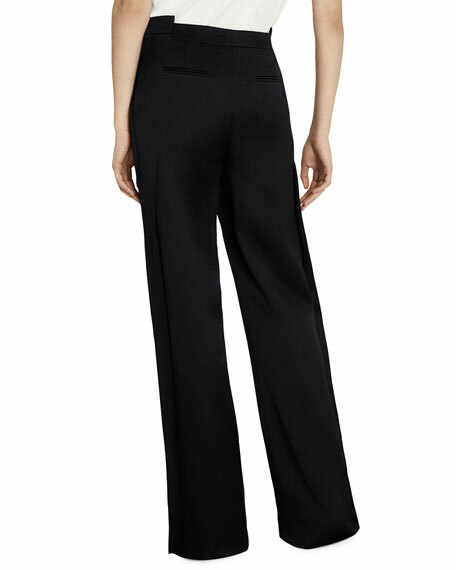 Derek Lam 10 Crosby pants. High-rise; paper bag waist. Double square buckles. Pleated front. Side pockets; back welt pockets. Fitted through wide legs. Full length. Hook/zip fly. Viscose/wool/spandex. Polyester lining. Imported. 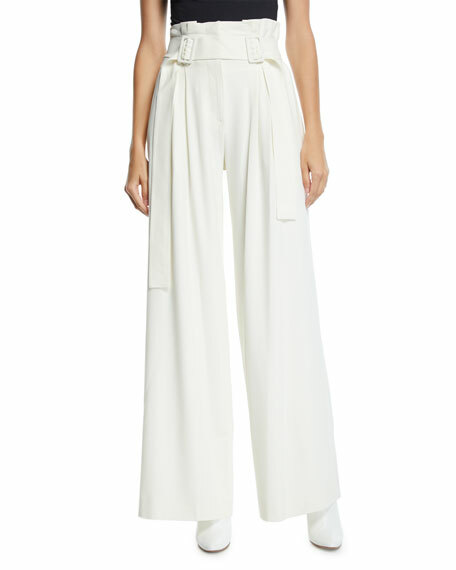 Helmut Lang "Rider" stretch-cotton legging pants. High-rise; flat front. Side slash pockets; back welt pockets. Fitted through skinny legs. Side-split hem. Full length. Hook/zip fly. Cotton/spandex. Dry clean. Made in Italy. 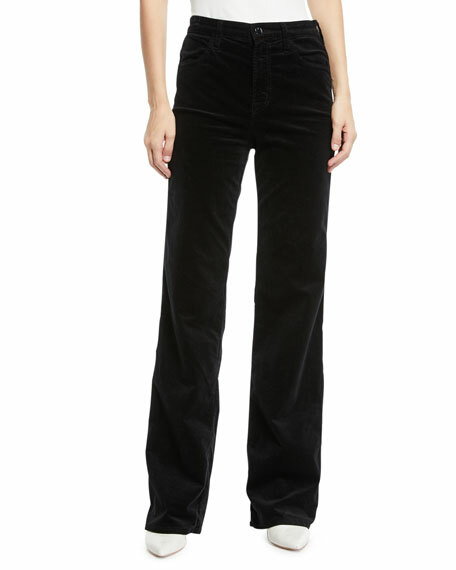 J Brand "Joan" velvet pants. Approx. measurements: 11.25" rise; 34" inseam; 20" leg opening. Five-pocket style. Fitted through wide legs. Full length. Button/zip fly; belt loops. Cotton/modal/elasterell p/polyurethane. Made in USA.